When you're raised in a hardworking environment with a household of eight, having an extrovert type of personality can come naturally and most of the time work to your advantage. Mike Backer was born in Detroit, Michigan in 1945. Shortly after, the war ended and his father relocated the family back to his small, home town of Dundee, New York. Mike recalls his father's work ethic with a tone of pride and I'm able to sense exactly where he gets his ambition. In the beginning, his mother stayed home to raise the Backer children and when the kids were older she was able to juggle a job as a telephone operator too. Unknowingly, his parents instilled in their son the distinct factors of life that allowed Mike to venture out into the business world, starting as a young child and stemming into his life as an adult and successful entrepreneur. A lady that would later catch Mike's full attention, also grew up in a similar environment. Born and raised in a suburb outside of Buffalo, New York in the late 50's, Cheryl and her sister were free to play outside as leisurely as they wished. Back when there wasn't a need to lock your doors at night. 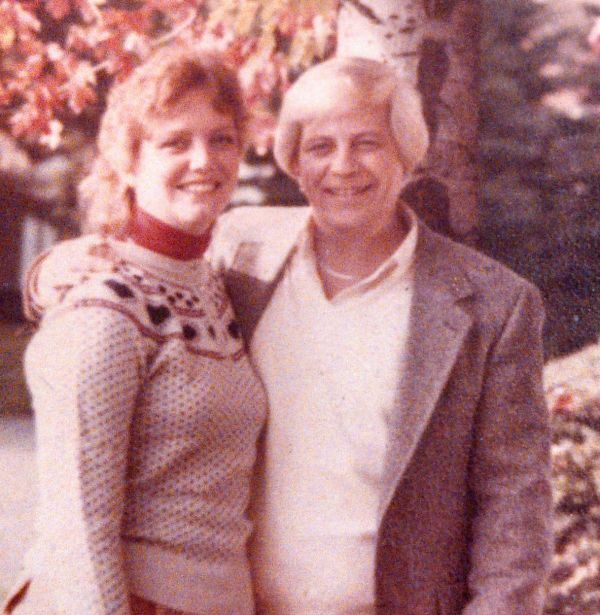 Cheryl Drury's father was a self-employed general contractor and her mother drove a school bus while also finding time to take care of the elderly. Just as Mike had, Cheryl took an interest in trying to figure out their calling at an early age. There was no sitting around, waiting on the next big thing to fall in their laps. These two were independent and determined to start somewhere. 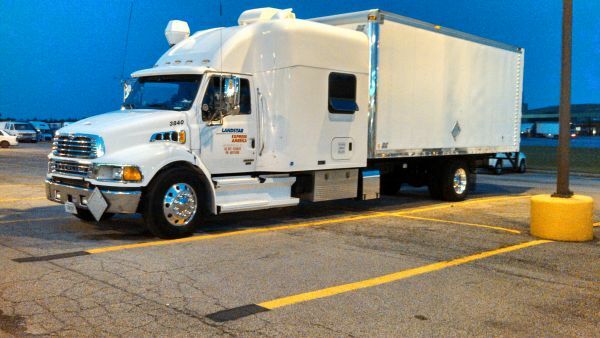 Mike was introduced to the trucking industry through his father. As early as he can remember, his dad was behind the wheel piggy backing trucks. He began driving an egg truck for a feed company. Then later moved up to a salesman. Once they landed in Dundee he picked up a cookie route, delivering and stocking the local stores. Mike attended a central school of K-12. It didn't take long for him to know which direction he wanted to take his childhood. Instead of sports, he was more interested in working and earning his own money. At ten, Mike had a newspaper route that he delivered on foot until he saved up enough to purchase a bike. "I still remember that bike. I bought it for $30... it was a Schwinn with chrome fenders." By 11, Mike had been bitten by the working bug. He began washing windows for the local merchants downtown in the business district. Mike would march into town with his bucket, brush and squeegee in hand and spend the next couple of hours earning $1 per window. That's considered mega bucks for that day in time. Especially for a kid! At 12 years old, Mike was hired on as the janitor of the town's newspaper. He understood what a huge responsibility this was when he was given a key to the office. The following year he landed a gig as a gas station attendant. At the time, it was a full stop service station. Mike was in charge of pumping gas for customers, washing their car windows, checking the air in their tires, etc. With gas being only twenty cents a gallon, I can imagine the work he put in. He gave everything that he had into his job, as well as his previous positions, right up until he graduated high school. At the age of 16, Mike had his license and bought his first vehicle from the owner of the gas station. It was a blue, 4 door 1951 Ford Sedan. "Ever since I bought that car, I've loved driving. I enjoy the country roads. Just everything about driving. Only now I have a purpose to drive." The December of 1963, after finishing high school, Mike went on to join the Air Force serving as an air policeman for four years. Mike moved to Moses Lake, Washington until the base closed in 1965. Then, Mike was sent to an Air Force radar site in Goose Bay, Labrador and remained there until his discharge in 1967. At the young age of 14, Cheryl was babysitting a few of the kids from town to earn her own keep. By 16 she had her first job as a waitress at a local diner. She got her license as soon as she could and kept her job until she graduated high school. Before her eighteenth birthday, Cheryl was hired on at a plant making pacemaker batteries. She continued working there for the next two and half years. She stayed with her next job as a medical courier for a medical laboratory located in Cheektowaga, New York for ten years. At the beginning she visited with hospitals and doctors' offices to retrieve samples to carry back to the facility for testing. Cheryl eventually worked her way up to a clerical position, then management by the age of 29. It was during one of her typical courier routes in 1985, when she and her sister came across a nice, quaint bed and breakfast in Hammondsport, New York. The two ladies decided to check it out for a bite to eat and while doing so, she met a man by the name of Mike that was also visiting the bed and breakfast. In conversation, Mike mentioned his fruit stand that he owned down the road. Well that fruit stand just happened to be on Cheryl's route, so one day she opted to stop by and grab an apple.... Little did the strangers know, that one apple would bring them together for the next thirty years. Cheryl and Mike quickly hit it off and six months later the couple opened a second restaurant in Bath, New York that Cheryl managed. In 1987, Mike was wanting to venture out and pursue another passion; NASCAR racing. At the time, he had been sponsoring a local race car and decided that he wanted more of the action. They sold both restaurants and Mike focused on putting a racing team together. The two moved to Greensboro and Mike worked out of his office in Charlotte, while Cheryl took a position as an operations manager with the medical laboratory in Durham. The racing situation wasn't panning out the way Mike had hoped. In 1992, the couple opened a golf shop, Duffers Golf located in Vass, North Carolina. Once the business was up and going, Cheryl left her job at the medical lab after 25 years. She tended to the retail and front-end of the store, while Mike worked in the back as a certified professional golf club maker. Their business was successful and continued to grow for a number of years. Then the economy took a nose dive. Golf equipment is considered a luxury item, not something people would put first before their more important means of living. With that said, in 2008, Mike and Cheryl ended up selling their store to another local competitor in town. Right before they made the final say to sell, Mike found an AARP magazine. In it featured an article about an older couple that was embarking on their second career. In the photo of the two, they were shown standing in front of a big rig. Immediately, Cheryl shot Mike's idea down. 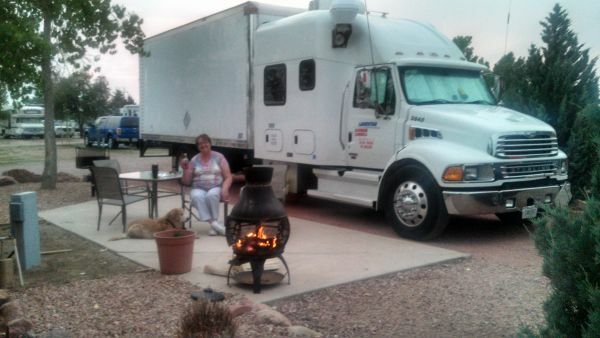 The thought of her having to drive an 18-wheeler was not an option in her mind. Later, Mike researched a little deeper and found some information on expediting. Of course his next step was to run it by Cheryl. Mike started it off by showing Cheryl the different styles of show trucks and the interior inside of the trucks and he could tell that he had her attention. Cheryl chimes in, "I remember saying, 'Now I could do that!'" The pair agreed that this would be their next adventure together. Knowing that this career would be something that they would be able to enjoy doing as a couple and also get to travel the country, was enough to get the ball rolling. They attended the Expedite Expo in Wilmington, Ohio and spoke with several different companies. The only issue they noticed was that most of the companies were hesitant because they didn't have their CDLs yet. Learning everything as they went along, they decided to sell the golf shop, jump in their Pontiac and headed straight to Nevada. There they enrolled into school in Boulder City at the A1 Truck Driving Training School. After they graduated and earned their CDLs, they began applying to a number of expediting companies. The calls started coming in immediately, much to their surprise. Still not knowing what to expect, but always relying on their determination and tenacity, they knew they were on the right track. The team went with a company based in Tennessee. Mike flashes back, "When we were picking up our truck, I kept thinking... this man must be crazy to put us rookies in something like this. I mean, he just handed us the keys to a $150,000 truck." Beginning this new course was much like any of their other investments; scary, exciting and most of all rewarding. Their first shipment was to deliver kitchen cabinets to Locust Grove, Georgia from Indiana. They stayed with this company for another year and a half, learning as much about the industry as possible. In time came a rate decrease and the duo felt it was time to move on. January of 2011, Cheryl and Mike found a good fit with a company out of Green, Ohio. They also purchased their first truck. It was an all-white 2007 Sterling Acterra with a 96" sleeper. The truck's previous owners were also a couple. Due to the design of the truck, loaded with a ready to use kitchen, including a sink, microwave, full refrigerator, full size bed, dish TV, lots of cabinet space, the couple is able to park at any camp ground around the country and make themselves as comfortable as being at home in their house. In April of 2013, the two noticed some changes taking place within the company that were headed in a direction that they were not interested in. When the rates went down, the long runs went dry too because of the flat rate. With them being on percentage and getting to the point that they wanted to slow down a bit, they knew this was their opportunity to make another change. They had been looking at Landstar Express America as a plan B for a while. The two decided to act on their notion and instantly felt a connection with the company. Cheryl's first impression, "The carrier is different. 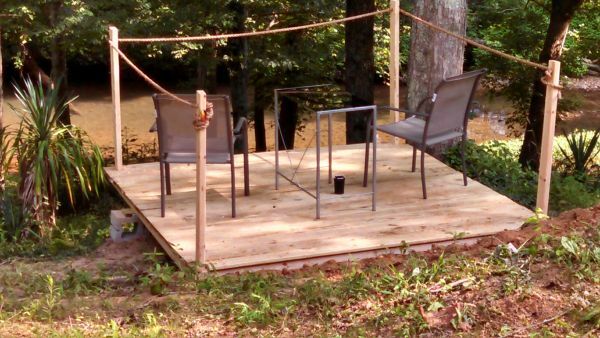 Right off the bat, I liked their business model and the independence that they allow is what sold me." Mike was on the same page too. 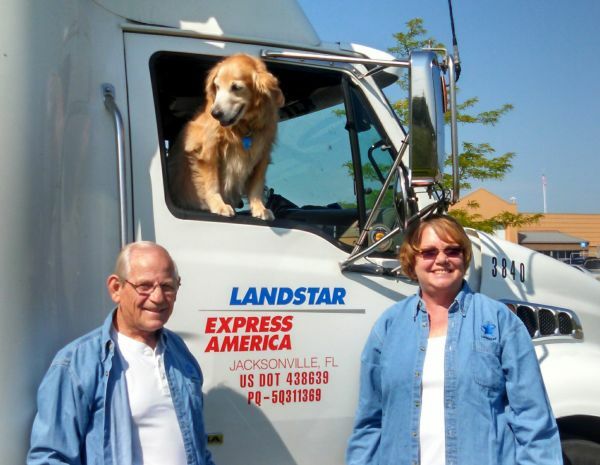 "Here with Landstar they give you more control of your daily runs and they treat you like a business person, in a sense. This is truly the best place for owner-operators. 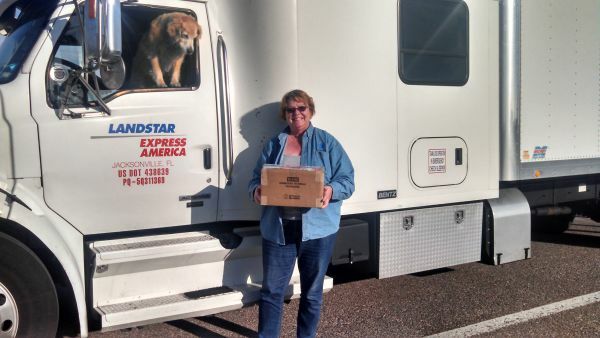 They have an open-door policy and I like the fact that Landstar is a company that gives back to their drivers!" The two combined, make a great team and an excellent example that it's never too late to begin a successful career in the trucking industry. Mike has reached well over 300,000 safe miles in the last six years. While Cheryl is right behind him with 240,000 safe miles. Each year the two have both been awarded safe driving awards from each company that they'd drove for. These days you can catch Cheryl and Mike traveling all over the map. They've been to every state except for Alaska and Hawaii. Mike's favorite part is the freedom that comes with being on the open road. "I like not knowing where we'll wake up the next day." They have two granddaughters both in their twenties, Marissa and Brianna. No great grandchildren as of yet. However, everywhere they go their nine year old Golden Retriever, Bristol is right there with them. They adopted their sweet girl while on a visit through Salt Lake City.